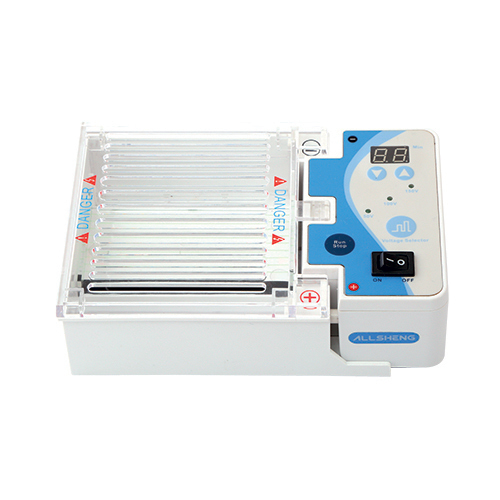 Mini-ES Mini Electrophoresis System is specifically designed for DNA and RNA electrophoresis. Voltages 35V/50V/100V, compact, lightweight and easy to operate are its features. A magnetic sensor allows current to flow to the electrodes only when the lid is in place. If the lid is removed while the system is operating, it will be shut down immediately. It's ideal for many applications, including Northern and Southern blotting, Cosmid library restriction analysis microsatellite analysis PCR fragment analysis, DNA fingerprinting and high-throughput analysis.